Growing your own fruit and veg organically gives you the peace of mind of knowing exactly what has gone into producing your food. No man-made chemicals, fertilisers and nasties. It also results in the freshest and tastiest fruit and vegetables possible. This doesn’t mean your garden fends for itself; you need to know how you can strengthen your plants’ health and learn how to use alternative ways of warding off pests. With these five main principles in mind, you can learn how to garden organically: a good site, healthy soil, biodiversity, sustainable resources, and avoidance of chemicals. Read on for our five simple steps on how to grow your own organically, find out about companion planting, find suppliers and recommendations for the best organic fruit and vegetables, and don't miss our other advice on designing a garden to ensure the rest of your space is just right. Select a sunny location for your vegetable garden – a spot which gets eight hours of sun a day if possible. Most fruit and vegetables need plenty of light and heat to photosynthesise. If you only have part sun, there are still good options of what you can grow, though, such as lettuce, greens and some herbs. You can grow a lot of food in a small raised bed or pots. Find out more about different creating a kitchen garden in our guide. You can also use our guide to container gardening in small spaces to discover how to grow organic fruit and vegetables on a sunny patio. Air is important for decomposition, so start the heap with a load of broken branches. Don’t add cooked foods, diseased waste or weeds. Add the ingredients in layers. Water occasionally. Cover to encourage build up of heat. Turn every few weeks. Good soil, abounding with nutrients and texture and full of life, is vital, especially with organic gardening. Healthy, fertile soil with a good structure allows plants to absorb water and nutrients, and encourages strong growth. Feed the soil with homemade compost, rotted manure or leaf mould. These bulky materials release nutrients slowly, improve soil conditions, and stimulate essential micro-organisms. The ‘No Dig’ method uses thick mulches to suppress weeds. Find inspiration for how to plan your own bountiful organic veg plot from these beautiful kitchen gardens dotted around the country. Garden Organic – advice, organic seeds and plants. The Organic Gardening Catalogue – seeds and supplies. Unwins Seeds – online organic vegetable seeds. Tamar Organics – seed and organic garden supplies. Organic Plants – offers a plants-by-month delivery option. Walcot Organic Nursery – organic fruit trees. It’s worth hunting out organically grown seeds and plants. Conventionally grown plants are often already loaded with pesticides and chemical fertilisers, or may be genetically modified – exactly the types of things you’re trying to avoid. See our suggestions for organic nurseries and online suppliers (right). Also look out for ‘organic’ labels at your local garden centre. As with all gardening, use the right plants in the right place. Select strong, healthy plants that suit your conditions, and look for naturally disease-resistant varieties. It’s well worth doing some research so you have a clear understanding of the kind of care each crop needs. See our top picks of organic fruit and vegetable options below. Now you’ve sited your garden, enriched the soil and selected your crops, it’s time to start planting and looking after your garden. Pay attention to what your plants need, including watering the roots not the foliage. Regularly inspect the plants and stay vigilant so you catch pest and disease problems right away. At the heart of organic growing is to keep your growing area in good health, rather than just pest- and disease-free. A diverse and vigorous growing system, good hygiene, and close observation all help prevent problems. You can suppress and control weeds naturally with a layer of bark mulch, composted straw or leaf mould, and removing any that pop up. Physical barriers, such as netting or cages, are a good idea to protect your ripening crops. Encourage a food chain balance to make wildlife work for you, from ladybirds eating greenfly to frogs devouring snails. Brightly coloured flowers will attract a wide variety of insects, and the more bees you attract to the garden, the more pollination and larger yields you’ll have. You can use biological controls for any pests. Remember to rotate your crops as this prevents build-up of diseases in the soil. Keep an eye on the watering; you don’t want your plants stressed as this makes them vulnerable to attack. Certain crops help each other. For example, plant a bed with sweetcorn, beans and squash together. Each plant provides natural shelter and protection for the other. The large leaves of the squash plants shade the sweetcorn’s roots from sunlight. They also act as natural mulch by suppressing weeds and preventing moisture from evaporating from the soil’s surface. The tall corn stems provide a sturdy support for beans to climb up. In turn, the beans fix nitrogen into the soil. Use our guide to find out how to create your own wildlife garden. 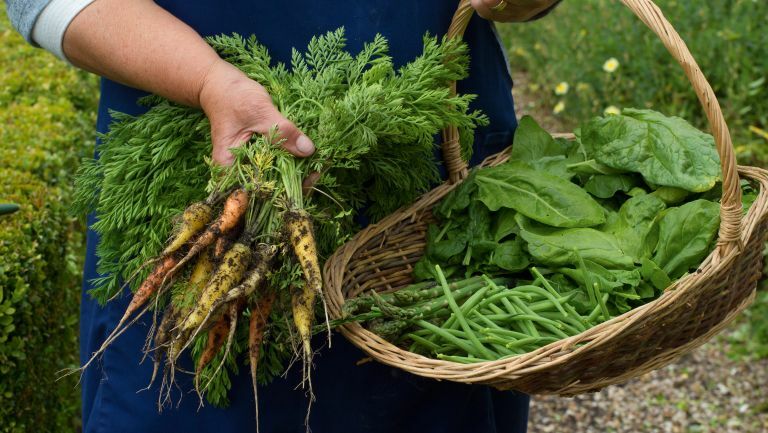 Use companion planting to your organic vegetable garden’s advantage. Growing strongly scented plants beside your crops either confuses pests or attracts them away from your produce. Basil – deters whitefly on tomatoes and kale. Chives – deter aphids and carrot root fly. French marigolds – deter aphids and whitefly, and attract hoverflies, whose larvae eat aphids; plant with tomatoes, aubergines and chillies. Rosemary – deters carrot fly. Sage – confuses pests of brassicas and deters carrot fly. Nasturtium – sacrificial crop, lures aphids away from beans and attracts beneficial insects. Dill – attracts hoverflies and wasps to eat aphids. Mint and sage – repel slugs; plant with cabbages and lettuces. Yarrow – attracts ladybirds and hoverflies. Fennel – attracts hoverflies and ladybugs, which prey on aphids. Lavender – attracts pollinators and deters aphids; plant with carrots and leeks. Nettles – attract cabbage white butterflies, keeping them away from brassicas. Try these suggestions for organically grown edibles. But remember: organic gardening is not for the perfectionist – you need to accept the odd nibbled leaf or imperfect-looking fruit and vegetable. Blackberries Easy to grow, blackberries are low maintenance and abundant in fruit. Plant between November and March. Water well in summer. Cut out the old fruiting wood after harvesting and tie in new canes in autumn. Yield is heavier if planted near other different cultivar. Squashes There are lots of different varieties – some summer, some winter. Sow in spring outside where they are to grow. Thin seedlings and keep the soil moist. Keep an eye out for slugs. Can be grown in large containers. Artichokes Very easy to grow from seed in spring. They need a sunny, sheltered position in well-mulched soil. Not only are they delicious to eat, but the plants are spectacular with architectural silver foliage and large purple flowers if left unharvested. Give them plenty of room as they can spread to 1m. Fennel Considered both a vegetable and a herb, sow fennel seeds as soon as the soil can be worked early in the season. Incorporate plenty of organic matter. Fennel is not difficult to grow and is a popular addition to organic gardens because it attracts ladybugs, which are natural predators of some of the most insidious garden pests. Figs Plant against a warm, south-facing wall or in a container, standing on pot feet to prevent waterlog. Long-lived and needs sun to ripen the fruit. Figs are ripe when the stalk bends and the hanging fruit produces a droplet of sugar on the base. Plums Not difficult to grow but need a warm, frost-free spot in well-drained, moisture-retentive soil. Mulch in mid spring and thin out young fruit to avoid laden branches breaking. Fallen fruit is adored by butterflies so leave them a few. Onions Easy to grow. Plant rows of onion sets in spring, in firm, well-drained soil in full sun. Prepare the soil in advance with well-rotted compost, as you don’t want a waterlogged heavy soil. Just remember to weed well. Ripened and ready for lifting by early to midsummer, store until early winter. Blueberries Delicious, high in antioxidants and easy to grow in acidic compost. Ideally plant in a sunny, sheltered spot, though they are tolerant of shade. Birds will also enjoy them so cover with a net as the fruits start to colour. Aubergines Treat them much as you would growing tomatoes. Sow seeds in spring and place in a propagator or on a warm indoor windowsill. They need plenty of warmth, ideally in a greenhouse or cold frame. If you have a sunny, sheltered position you can grow them outside, and they are easily moved around if grown in a container. Chives Cold hardy, but need well-drained soil. Both leaves and flowers are edible. Sow seeds directly into the soil as soon as it is workable. Chives are also very easily transplanted in case you want to dig up the plants and move them to another area. Chilli Peppers Colourful and diverse, they are a favourite for growing in pots. The more controlled environment of a pot allows for easy weeding and watering. Most species of pepper respond well to sunlight and warm weather and attract relatively few pests.